Fine Tune Optimal Exposure – How Does It Work? Have you ever thought your camera’s metering system of choice was consistently under or overexposing your images? If you are shooting almost any Nikon from the D90 up, you have the ability to fine tune the exposure, adding or subtracting up to one stop of exposure in 1/6 stop increments. This allows you to push your camera’s exposure in one direction or the other on a semi-permanent basis. I say semi permanent because you can set it back to factory specs any time you want. Fine tuning optimal exposure is like leaving the exposure compensation settings on all the time, except that you don’t have to think about it with the fine-tuning system. You just test it (find best exposure), set it, and forget it. As I briefly mentioned before, the Fine tune optimal exposure setting allows you to fine tune the Matrix metering, Center-weighted area metering, and Spot metering systems by +1/-1 EV in 1/6 EV steps. Nikon has taken the stance that most major camera systems should allow the user to fine tune them. The exposure system is no exception. As mentioned, Fine tune optimal exposure works like the normal compensation system, but it allows only one EV of compensation. As shown in figure 1, screen 3, an ominous-looking warning appears when you use Fine tune optimal exposure. It lets you know that your camera will not display a compensation icon, as it does with the +/- Exposure compensation button, when you use the metering fine-tuning system. This simply means that while you have fine tuning dialed in for your light meter, the camera will not remind you that it is fine tuned by showing you a compensation icon. If it did turn on the compensation icon (+/- on the Control panel and in the Viewfinder), it couldn’t use that same icon when you use normal compensation. 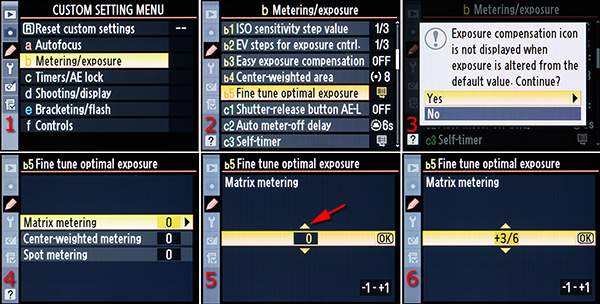 Select b Metering/exposure from the Custom Setting Menu and scroll to the right (figure 1, image 1). Select Fine tune optimal exposure and scroll to the right (figure 1, image 2). Select Yes from the warning screen and scroll to the right (figure 1, image 3). Select the metering system you want to adjust. In figure 1, image 4, I selected Matrix metering. Scroll to the right. Scroll up or down in 1/6 EV steps until you reach the fine-tuning value you would like to use (figure 1, image 5, red arrow). In figure 1, image 6, I selected +3/6 (1/2 step EV). Press the OK button to lock in the fine-tuning value for the metering system you selected in step 4. That’s all there is to it! Remember that you have Fine tune optimal exposure turned on because the camera will not remind you. Watch your histogram to make sure you’re not regularly underexposing or overexposing images when you have the fine-tuning adjustment in place. If needed, adjust the fine tuning up or down, or turn it off. You must fine tune each metering system separately. Note for D7000 and D600 users: Fine tune optimal exposure applies only to the user setting (U1, U2, or non-user setting) you are currently working with. If you are working with U1, then U2 and non-user settings are not changed. Be sure to save the user setting in the Setup Menu if you change one of them. My Recommendation: Fine tune optimal exposure is a rather controversial setting. On my older Nikon D300, I found that I took better pictures when I ran the Matrix meter 3/6 (1/2 EV step) over the normal setting. The D300’s Matrix metering seemed a bit conservative to me and it worked a little too hard to keep from blowing out the highlights in my images. It seemed to underexpose them by about 1/3 EV step most of the time. I could see this underexposure because on most of my Matrix meter exposed images, the histogram didn’t quite make it to the right edge (lighter values) of the histogram window, which I prefer. I like to expose for the highlights, yet my older D300 seemed to slightly underexpose. I do not need to change the default on my D7000 or any of my other Nikon cameras. Remember that adjusting an exposure is always an experiment. If you choose to fine tune any of the three metering systems, you should thoroughly test it before you do an important shoot. The way I fine tune my camera is based on my own photographic style, and my results can’t guarantee that you would get the same results. It certainly won’t hurt to play with these settings—as long as you remember to set them back to 0 when you’re done—if they don’t perform the way you expect. Thanks for your article on Nikon’s fine-tune optimum exposure. As a user of two Nikon Pro D4/D4s bodies, I’ve noticed the exposure meters do not match and your article has taught me (although I’ve not fully read it all yet) something I didn’t know about these cameras!!! I guess I can use my Expodisc to help calibrate the two cameras?